Following our October launch of the Hamilton Capital Canadian Bank Variable-Weight ETF (HCB), today we launched the Hamilton Capital Australian Financials Yield ETF (HFA). Both of these ETFs pay monthly dividends. HFA seeks to generate a yield of 6.5% or higher from a portfolio of higher dividend-paying Australian financials operating in arguably the world’s strongest and safest financial sector (aided by covered calls). Of note, the Australian financials have experienced long-term outperformance versus the Canadian financials and in fact, the Australian banks outperformed the Canadian banks during the financial crisis. In this update, we explain why investors of preferred share ETFs seeking monthly income should consider switching to HFA and/or HCB. Investors in preferred shares (and preferred share ETFs) seeking yield accept the trade-off of a lack of (dividend) growth in exchange for lower risk, including presumably lower declines in market corrections relative to equities. However, 2018 has been very telling for preferred share ETF investors, as many experienced “equity-like” drawdowns. In effect, this risk/reward trade-off broke down – again. 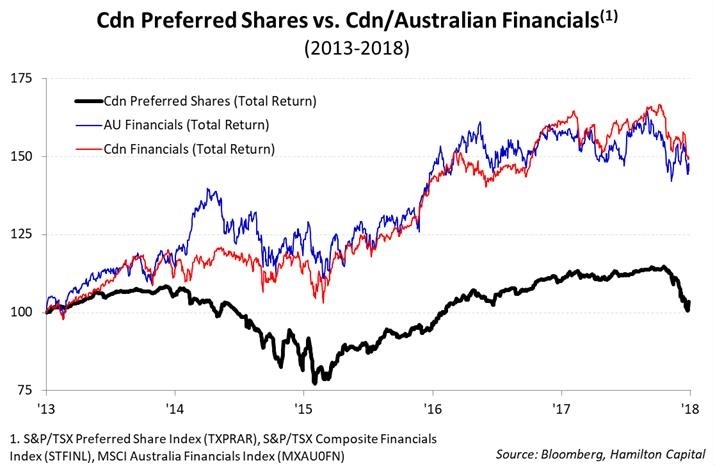 The chart below shows the performance of the preferred share index over the past five years relative to the Canadian and Australian financials (both low beta sectors). This chart offers some important insights on the performance of preferred shares since 2013, namely: (i) this low growth/low risk trade-off has broken down many times; (ii) the preferred share index has generated close to zero returns in five years, even including dividends; and (iii) preferred shares have experienced meaningful drawdowns, exceeding those of the “low beta” Canadian and Australian financials. Not surprisingly, those investors who bought preferred shares (and preferred share ETFs) in the last five years would have generated dramatically higher returns had they invested in ‘low-beta’ financial sectors like the Canadian and Australian financials. As a result, there is a compelling case to be made that investors of preferred share ETFs seeking monthly income should consider switching to HCB and HFA, which pay monthly distributions derived from (growing) dividends in two world class financial sectors. 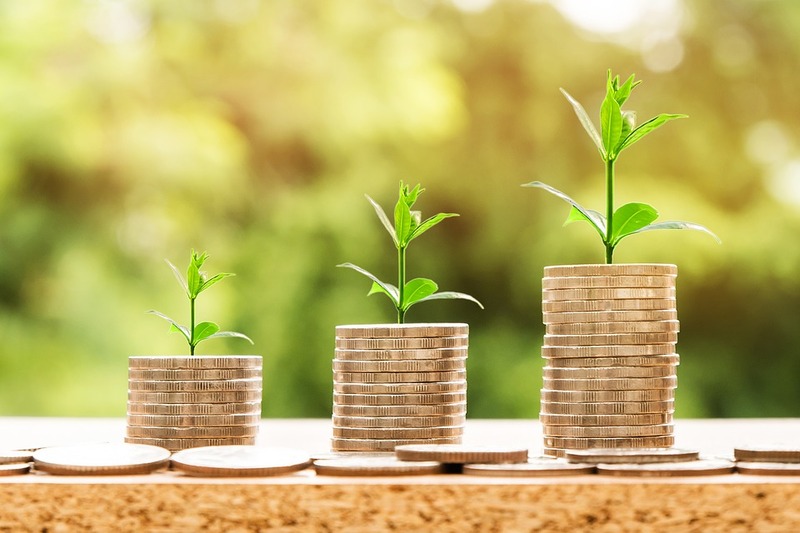 The Hamilton Capital Australian Financials ETF (HFA) pays monthly distributions and invests in Australian financials, which have a long-term history of outperformance versus their Canadian peers. HFA seeks to generate a yield of 6.5% or higher, aided by covered calls. The Hamilton Capital Canadian Bank Variable-Weight ETF (HCB) pays monthly distributions and invests in the Big-6 Canadian banks. HCB seeks to capitalize on one of the most popular themes in Canadian bank investing – mean reversion – by rebalancing each month to overweight the 3 recent underperforming banks to 80% and underweight the 3 recent outperformers to 20%. Its current yield is 3.5%1As of December 14, 2018.